CRM company Salesforce yesterday unveiled its artificial intelligence platform Salesforce Einstein to help companies deliver more predictive and personalized customer experiences across sales, service, marketing and commerce. Salesforce Einstein embeds advanced AI capabilities in the platform – in fields, objects, workflows and components – so customers will be able to build AI-powered apps that get smarter with interactions, using clicks or code. "With Salesforce Einstein, we are delivering the world's smartest CRM," said Marc Benioff, chairman and CEO, Salesforce. "Einstein is now every customer's data scientist, making it easy for everyone to take advantage of best-in-class AI capabilities in the context of their business." AI is creating new ways for people to engage with technology and with one another. Various forms of AI already power some of the world's most popular consumer experiences. Apple's Siri leverages natural language processing to recognize voice commands. Facebook's deep learning facial recognition algorithm can instantly identify a person with nearly 98 percent accuracy. And Amazon, Netflix and Spotify all use machine learning to understand how each item in their massive catalogs relates to the other and each customer's preferences. For most companies, however, the technical expertise and infrastructure required to develop AI solutions are beyond reach. They must bring together massive and diverse data sets, which requires significant engineering resources to manage complex data integration processes. Specialized predictive models must be built to extract value from the data and continuously learn from it, requiring extensive data science expertise. And infrastructure and DevOps support are required to maintain these models and keep all of these processes up and running. Finally, bringing results – the insights and recommendations from the models – to users within the context of their business requires complex integrations. 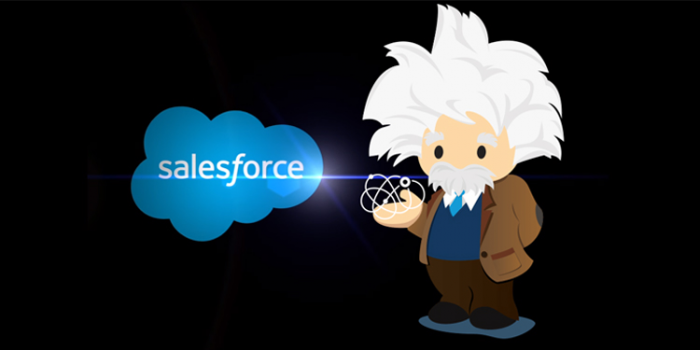 Einstein leverages all the data in Salesforce – customer data; activity data from Salesforce Chatter, email, calendar and e-commerce; social data streams such as tweets and images; and IoT signals – to train predictive models. Powered by advanced machine learning, deep learning, predictive analytics, natural language processing and smart data discovery, Einstein allows models to be automatically customized for each customer. These models aim to learn, self-tune and get smarter with every interaction and additional piece of data. Salesforce says Einstein will automatically discover relevant insights, predict future behavior, proactively recommend best next actions and even automate tasks so that customers can deliver more personalized and predictive customer experiences. Sales Cloud Einstein will include Predictive Lead Scoring for sales reps to focus on closing the best leads, Opportunity Insights that alert reps when a deal is trending up or down and Automated Activity Capture which logs email and calendar activity with the right record and analyzes them to deliver predictions. Service Cloud Einstein will include Recommended Case Classification which automatically pre-populates key case fields, enabling predictive routing of cases to the right agent and enabling agents to resolve customer issues faster. With Recommended Responses, service agents will be pushed the best responses, and Predictive Close Times will predict the time needed to resolve an issue. Marketing Cloud Einstein will include Predictive Scoring which scores customers' likelihood to engage with an email, Predictive Audiences which builds custom audience segments based on predicted behaviors and Automated Send-time Optimization which predicts the optimal time to deliver messages based on past customer behavior. Commerce Cloud Einstein includes Product Recommendations to personalize product recommendations to shoppers, Predictive Sort which will infuse personalized sort and search results based on likelihood to engage and Commerce Insights that will help retailers understand product purchase correlation. Community Cloud Einstein now includes Recommended Experts, Articles and Topics to suggest posts, articles, experts and topic pages; Automated Service Escalation which creates a case in Service Cloud if customer posts do not receive a timely response; and Newsfeed Insights which highlights the most relevant and popular content in every feed. Analytics Cloud Einstein will deliver Predictive Wave Apps that uncover future patterns for any business process, Smart Data Discovery to help users find and explain insights from millions of data combinations and Automated Analytics & Storytelling which will automate and prioritize the next insight users need to know. IoT Cloud Einstein will include Predictive Device Scoring which will score streaming data from connected IoT devices, recommend best next actions for service processes and marketing journeys based on the scoring of that device data, and Automated IoT Rules Optimization which will actively update the rules that govern how IoT data is managed. Salesforce says with a few clicks, admins will be able to build apps that include Einstein-powered fields in any object, page layout or workflow, making business processes smarter. And for data scientists and developers, there will be Predictive Vision and Sentiment Services to enable developers to train deep learning models to recognize and classify images and sentiment in text. And PredictionIO in Heroku Private Spaces looks to help developers build custom machine learning models and put them into their apps. Dreamforce attendees will have the opportunity to dive deeper into Salesforce Einstein by attending the Einstein Keynote on Thursday, Oct. 6, from 3-4pm PT in Moscone West, or tuning into the livestream. Also announced yesterday is the Salesforce Research group, a team of researchers and data scientists under the leadership of Richard Socher, Chief Scientist at Salesforce and renowned data science researcher. Salesforce Research will be focused on delivering AI research across deep learning, natural language processing and computer vision to its product and engineering teams.